This is just a little more to the right from the view I posted on the last photo. 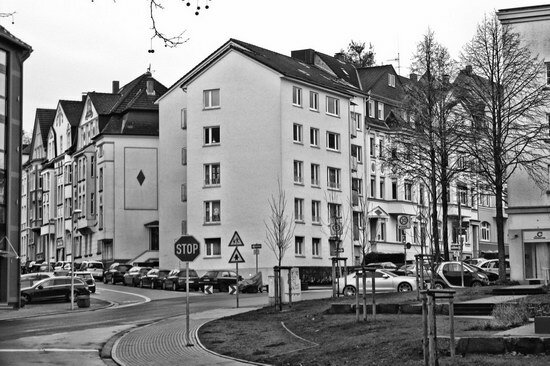 Here the Leibnitzstraße (from the left), the Kämpchenstrasse (from the top) and the Muhrenkamp (from the right) meet and end up down on the Dickswall. This is also the corner on which I took the stop sign photo, which you can see on the foreground :-). There’s a tiny little park on the right, which was actually completely bulldozed over last year, killing at least two huge trees, when a rain reservoir was constructed beneath it. Fortunately a few new trees were planted, but it will take another fifty years or so for them to grow as big as their predecessors.